Found 5 file extension associations related to ViewletBuilder and 2 file formats developed specifically for use with ViewletBuilder. 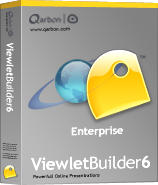 Developer / company: Qarbon Inc.
With over 7 years on the market, ViewletBuilder is a tried and true solution with an extensive base of satisfied customers. Take a look at the list of some of our customers and see real examples of how they are using ViewletBuilder to service their customers, prospects, employees and partners. With solutions for Windows, Linux and Mac, ViewletBuilder is the only online content creation solution for the increasing number of companies with multiple operating system platforms. And ViewletBuilder’s support for development in over 9 languages is the only choice for multi-national organizations. Review how our recording, editing, enhancing and publishing features can benefit you and your organization. Better yet, download a free trial of ViewletBuilder and see for yourself how quick, easy and cost-effective it is to create and publish compelling, professional looking online content. ViewletBuilder’s Professional’s extensive interactive features make it easy to involve and engage your viewers in your presentations with sophisticated capture, evaluations and feedback tools. If you need more information please contact the developers of ViewletBuilder (Qarbon Inc.), or check out their product website.